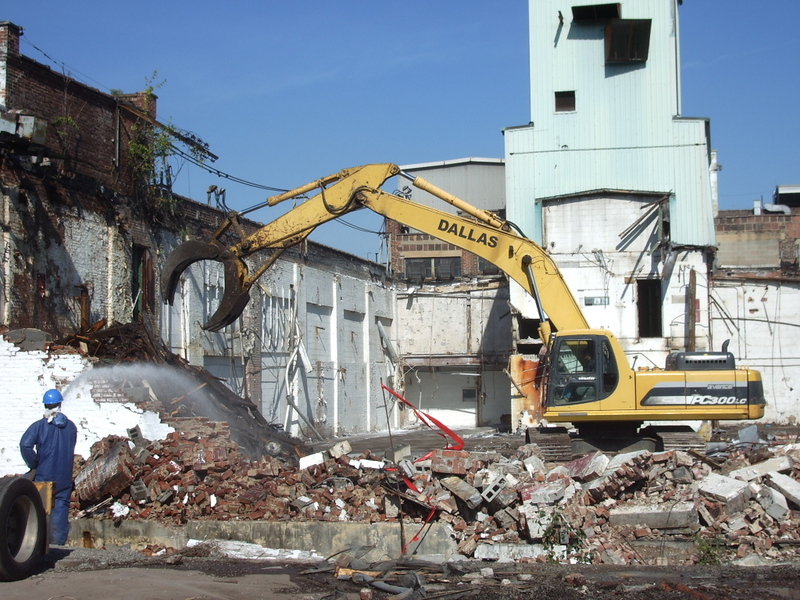 Dallas Contracting Co., Inc., a member of the National Demolition Association, was contracted by RC Andersen, LLC to demolish the former Penick Corporation manufacturing facility in Newark, New Jersey. The plant demolition is part of a larger redevelopment of the site. 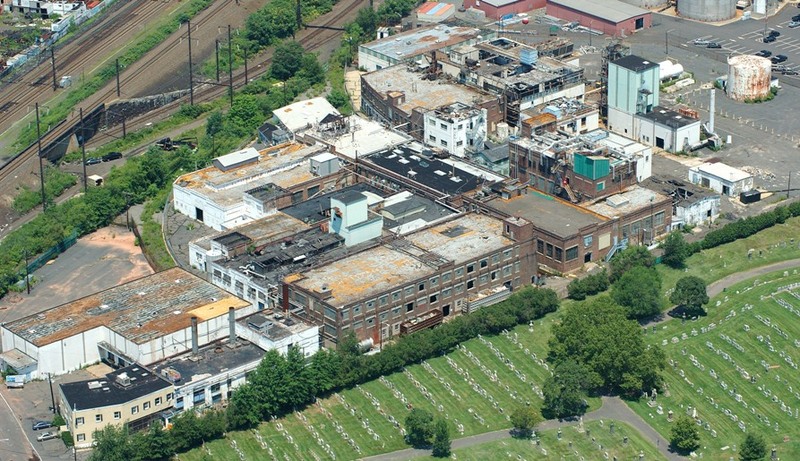 The former Penick plant located in Newark, NJ, was a contract manufacturer of controlled active pharma ingredients. The company produced a variety of inorganic chemicals, especially bismuth salts, several products via chemical synthesis or fermentation and a full range of opiate narcotics. Its main products were codeine and morphine. The site consisted of over 30 multi-story buildings and structures along with a sizeable parking lot area. The total square footage of buildings was over 250,000 square feet. As the plant had been added to and modified over the years, the buildings were an eclectic collection of building materials. Some buildings were comprised of large wood beams, with concrete floors and brick walls whereas other buildings were built using concrete encased steel beams and heavily reinforced walls and floors. The basic goal of the demolition phase of the project was to raze everything to the ground and remove all foundations and footings to four (4) feet below grade. Although the goal was clearly defined, the project posed numerous challenges for Dallas Contracting Co., Inc. (Dallas Contracting) such as environmental hazards, asbestos containing materials (ACM), proximity to an active beverage manufacturing plant, diverse composition of building materials and scheduling constraints. Prior to demolition, several tasks needed to be completed including obtaining disconnects for all utilities, installation of erosion control measures, obtaining the demolition permit and development of project specific paperwork (Work Plan, HASP, EPA 10 day notification and OSHA Engineering Survey). In addition, there was a substantial amount of asbestos containing materials (ACM) throughout the site. Dallas Contracting subcontracted the Mack Group, LLC to perform asbestos abatement services. ACM included roofing materials, flashing, pipe wrapping, boiler insulation, tile, mastic and grout. 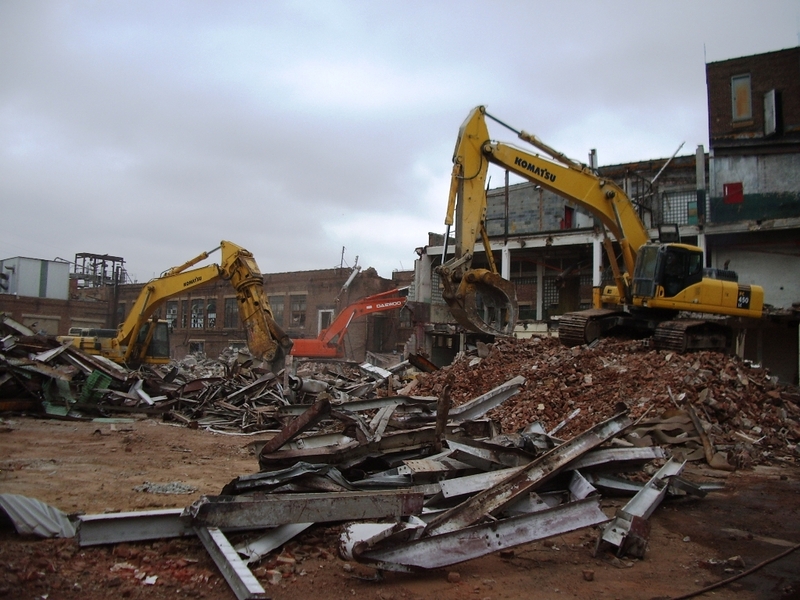 To accomplish the demolition of the buildings and structures to grade, Dallas Contracting utilized its extensive fleet of equipment and trained personnel. 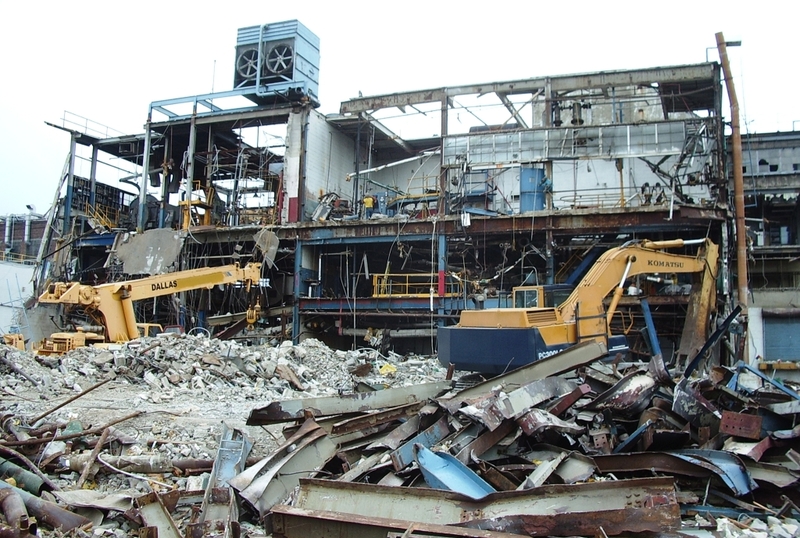 Equipment utilized to complete the demolition included a Komatsu PC-400-LC6 mounted with a Labounty rotating shear (MSD-70R), Komatsu PC 450 LC with shear and grapple attachments, a Komatsu PC-400 mounted with a concrete pulverizer jaw attachment (this was also used at times with a Labounty straight shear), a Komatsu PC300-5 mounted with a grapple (also used with a shear attachment), a Komatsu PC200-LC6 mounted with a grapple, a Fiat wheel loader and several Cat 236 skid steers. The site crew had an average composition of ten employees. To offset the cost of the project for the client, Dallas Contracting carefully dismantled several of the wood beam construction buildings. Dallas Contracting has had significant experience with salvaging of wood beams and planks and knew that the salvaging efforts would not only make economic sense (the salvaged wood materials can be reused) but it was also an environmentally conscientious decision (wood materials re-utilized versus transporting to landfill for disposal). The buildings dismantled consisted of five (5) multi-story buildings, composed of a mix of short leaf and long leaf Yellow Pine and some Douglas Fir, with an approximate footprint of 75,000 square feet. A dedicated crew was utilized to dismantle the buildings with a separate crew dedicated to preparation and loading of the bundled salvaged wood materials. Nearly 100,000 board feet of salvaged wood materials were reclaimed from the buildings. The reclaimed timbers and planking were either milled into new timbers or new flooring. A minimal amount of wood waste was generated for offsite disposal. Another benefit was that the remaining brick materials were very clean of any debris which made future onsite crushing easier as well as producing a better final crushed product. Additional cost savings came from Dallas’s ability to salvage and sell used equipment. Dallas rigged out and salvaged numerous used pieces of equipment. The equipment consisted of reactors, presses, centrifuges, lab equipment, process equipment and large motors and pumps. Debris was carefully separated from recyclable materials and shipped offsite for disposal. Concrete, masonry and brick were set aside for onsite crushing. Steel and metals were sent offsite for scrap metal recycling. Dallas estimates that over 2000 tons of steel and metals were sent offsite for scrap metal recycling. Once the structures were demolished to grade, Dallas Contracting proceeded to remove all slabs, foundations, footings and asphalted areas. This work was accomplished utilizing the mentioned heavy equipment with the addition of a Komatsu 300 with 8,000 psi hammer, a Komatsu 200 with 5,000 psi hammer and a Cat 963 track loader. 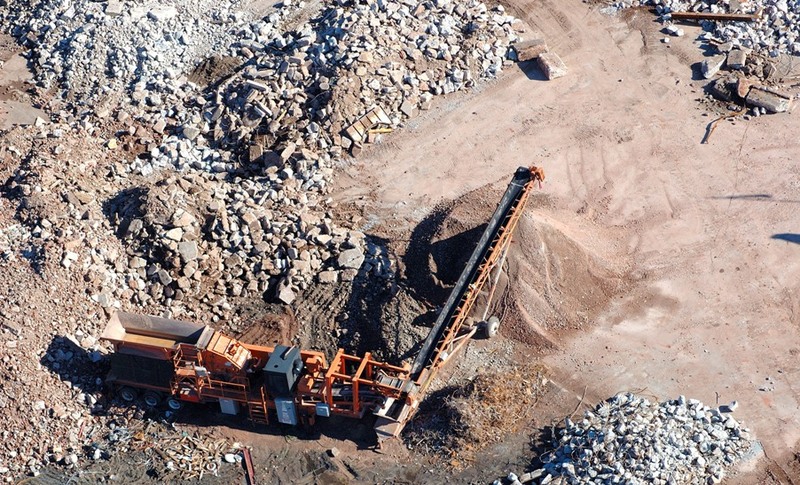 Concrete, brick, masonry and asphalt were crushed onsite into 2 ½ inch or smaller material using an Eagle Crusher Company, Inc. UltraMax 1000-15CV Plant with stacking conveyors. Dallas Contracting has owned this unit for over five years and was extremely pleased with its production on this project. Daily crushed material production was over 1000 tons and Dallas estimates that over 25,000 tons were crushed in total. Crushed concrete, brick and masonry were stockpiled separately from crushed asphalt materials. The crushed materials will be reused onsite by the developer for backfilling and grading purposes. Safety is always paramount on demolition projects and this project was no exception due to the proximity to active manufacturing operations. OSHA regulations were strictly adhered to and enforced. The entire project was completed in approximately six (6) months without incident or injury. Dallas Contracting Co., Inc. has been in business for 26 years, is financially sound (D&B Rating of 3A2) and works on a nationwide basis. Dallas Contracting Co., Inc. offers a turn-key approach to demolition, onsite concrete crushing, scrap metal recycling and used equipment purchasing by offering all of these services under one roof.